Skype is a wonderful system that helps you to stay connected with friends and family abroad. The video calling feature makes the experience all the more awesome enabling you to catch your dear ones in action in real-time. Now, what if you need to record a Skype call? It could be that you would talking to special person in your life on a special occasion and hence you would love to preserve the video call forever. Well, you have the screen recording software programs today to help you here. Movavi Screen Capture Studio for Mac is one of the most renowned software programs when it comes to recording streaming Skype video calls in Mac devices. The article here offers a short review on the Movavi program followed by a brief on how to work with it. Before getting into the features of the Movavi software it should be mentioned that Movavi is an internationally famous award winning name, trusted in as many as 150 nations. The Movavi Screen Capture Studio for Mac comes with a simple user interface and you won’t need to learn any special technical skill to operate the Movavi program. The Movavi program is able to capture audio from both the output & input devices simultaneously. This is a great help while you are going to record the Skype calls. Movavi Screen Capture Studio for Mac will allow you to edit the recorded Skype video as well. Thanks to SuperSpeed mode, Movavi Screen Capture for Mac can save the video call within seconds. You would be able to convert the recorded video in any popular audio video format as the Movavi program is compatible with 180+ media formats. Download & install Movavi Screen Capture Studio for Mac in your Mac device. Set the Skype audio parameters. Click on System Preferences followed by Sound. You will find current system output & input audio devices selected on corresponding tabs. Open Skype, hit on ⌘ on keyboard & move to Audio/Video section. 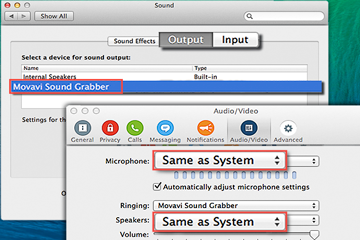 Select similar options in Speaker & Microphone menus. Go to Skype window & start calling. When the other person takes up the call , adjust Capture Area & fit call window. Hit on REC in Screen capture and the Movavi program will start to record your call. If you need to pause somewhere in the middle, hit ⌘⌥1 on keyboard. Press on ⌘⌥2 when you want to stop recording. Next Entry: Xperia Z3 – Why Should You Purchase This Phone? Next Entry Xperia Z3 – Why Should You Purchase This Phone?